WYSIWYG Reports is a highly customizable reporting tool, allowing you to build HTML and PDF reports using any data point in Raven. Just like in Report Wizard, WYSIWYG Reports lets you create customizable reports based on your own Internet marketing campaign data. These reports still can be branded, automated and delivered directly to your clients — but now with ultimate control over the information that goes into them. How much time do you spend on reporting right now? Hours? Days? 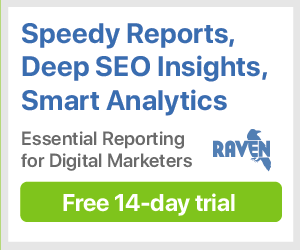 Raven's reporting tool will turn that month-end ordeal into the quick, simple affair. WYSIWYG Reports can generate a stylish, professional HTML report with dozens of data points with just a handful of clicks. Not only does Raven create reports quickly, but it automatically saves a history of those reports for fast reference. Just like Report Wizard, you can add pre-defined sections of data to your reports. Unlike Report Wizard, you can throw away unwanted elements of that report with a single click. Not interested in bounce rate? Just delete the Key Performance Indicator (KPI), while leaving everything else alone. Would you rather see your number of tweets in a line graph? Just edit the widget and change its style. Creating a report for non-English client? Rename your sections and KPIs for ultimate localization. Not satisfied with the metrics in our pre-built sections? Looking for one very specific number that will knock your client's socks off? Add a custom widget! Raven has more than 300 KPIs to choose from, giving you the ability to create the report of your clients' dreams. In addition to custom KPIs, you can also add custom text summaries and even file attachments to your reports, giving new meaning to "comprehensive." Never again fool around with a clunky template! Once you've uploaded a logo to Raven, you can select it for your report. Just click the Add Logo button and either pick an existing image or upload a new one. Want status reports delivered to you — or your clients — automatically? Set up a schedule for any report in WYSIWYG Reports and you'll never have to run it manually again. Raven can deliver your reports by email as often as you choose, from daily to quarterly.